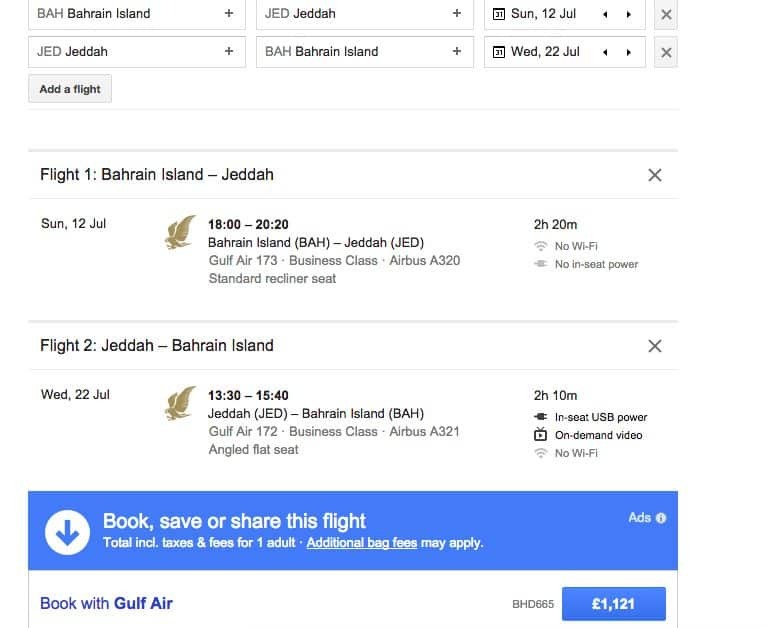 This review is for the Abu Dhabi to Bahrain to Jeddah flights. On our way to Umrah I used some of my Virgin Atlantic miles to book Gulf Air from Abu Dhabi to Bahrain return and then Bahrain to Jeddah. Due to the fact that it was the last 10 nights of Ramadan and Etihad was fully booked it was the only option and the cheapest one as well. It costs 12,000 miles return in economy plus £70 in taxes or 24,000 miles return in business class plus £70 in taxes per person. I did have a stash of Virgin Miles I could use from taking advantage of conversion promotions on the Tesco Clubcard and American Express. 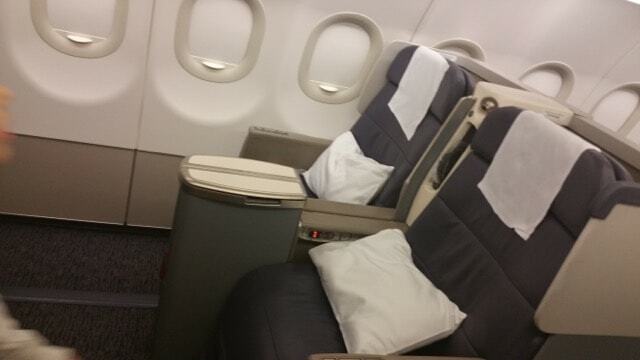 I decided to book business class for us as all of the trip was in business so far. If you have read my nightmare of Gulf Air you will know it was not what I expected. The awards were booked on two separate tickets, Abu Dhabi to Bahrain and Bahrain to Jeddah all return. 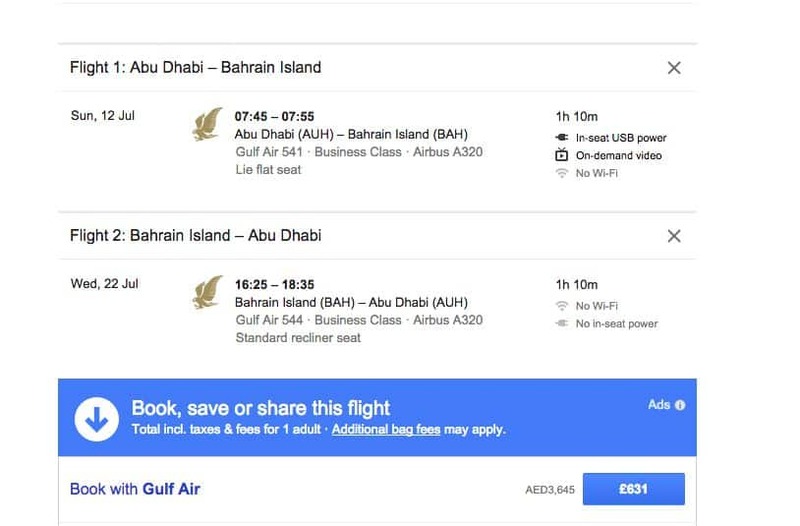 In short Gulf Air said they can’t find our Bahrain to Jeddah ticket in their system even though we had an e-ticket from Virgin. You can read more of the ‘not so great’ experience here. We spent 50 minutes at the check in counter speaking with the Gulf Air manager who insisted it was Virgin’s fault and that we only have a flight to Bahrain. Our Jeddah connection was not available at all. We made it to the flight just before departure. 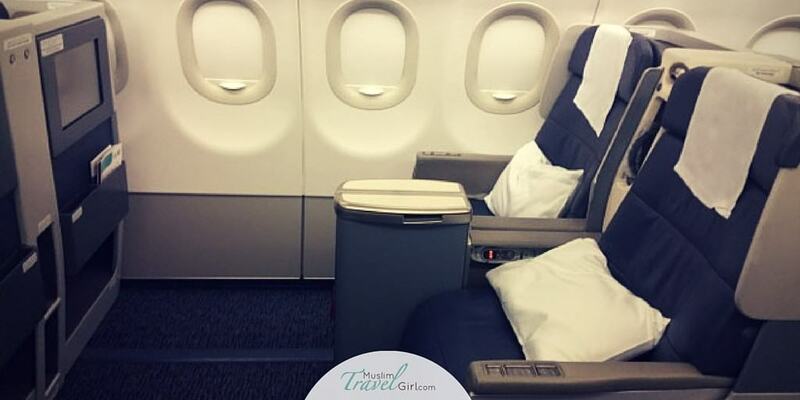 The counter for business class Gulf Air is the same as the Etihad business class. Polite staff and quick passport control. As it is a private area there were no crowds there and it was very quiet. 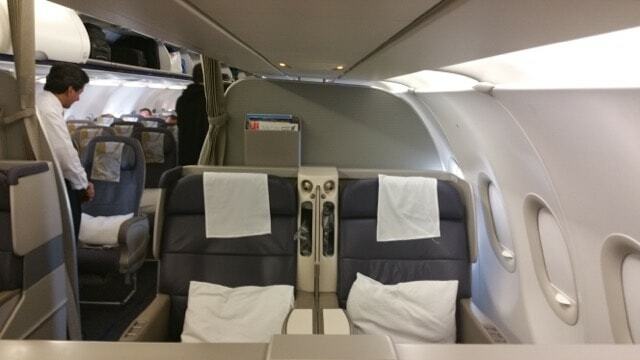 On our way in business class it was the A320 plane with fully flat beds. The aircraft is definitely not new and there was plenty of wear and tear. However the seats were large and very comfortable. I believe it is the same aircrafts that fly the Bahrain to London routes. We were the only two people in business class, considering it is only a one hour flight from Abu Dhabi to Bahrain I can see why. The cash ticket was approximately £400 per person. 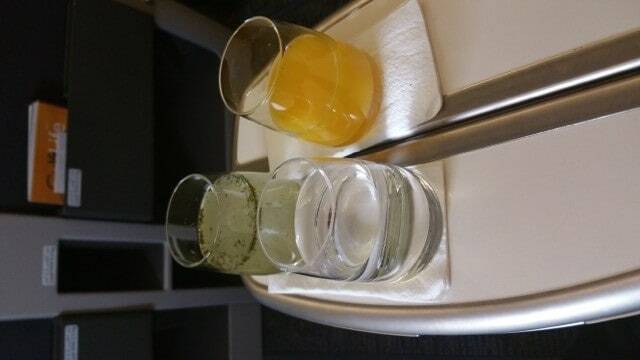 We were offered pre-departure drinks, mint juice, water and orange juice. After departure they offered us Arabic coffee and dates plus any breakfast. I declined the breakfast because I was really stressed and tired so I just slept. I pulled the bed almost flat and closed my eyes for 40 minutes. We spoke to the staff on the flight in business and they were really nice, one of the ladies was British working with Gulf Air for 10 years and the other was an Arab. 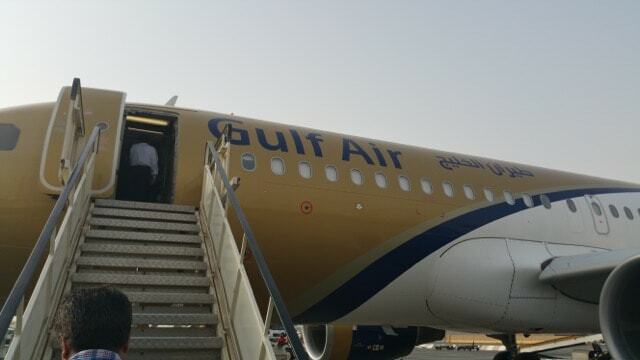 They were very considerate and polite which is a total contrast to what the Gulf Air ground support staff are like. We landed with no delays and as we were the first to disembark we headed to the transit area to sort out Bahrain to Jeddah flights. We paid 24,000 Virgin miles for a return flight and £70 for taxes for two people. If we were to pay cash it would have cost us £1260 for two. On this flight we were in economy. After about 2 hours of a horrendous customer service, £100 phone bill to Virgin we were allowed to board in economy. Just typing this post makes me annoyed as I remember the bad treatment. If you want to read more you can here. The flight was fully booked which is totally understandable since it was the last 10 nights of Ramadan and very busy in Makkah. We were finally seated on the plane and I had an exit row seat next to a Saudi lady who lives in Dammam. The flight is only 2 hours and thank God for this since it was the worst exit seat I have ever had. It was so small I couldn’t fit in it. I didn’t have anything to eat as I was exhausted by this time and I just wanted to get to Makkah and sleep. What was really interesting however is the fact that I would assume the route from Bahrain to Jeddah is much more busy then the Bahrain to Abu Dhabi yet the aircraft was smaller. 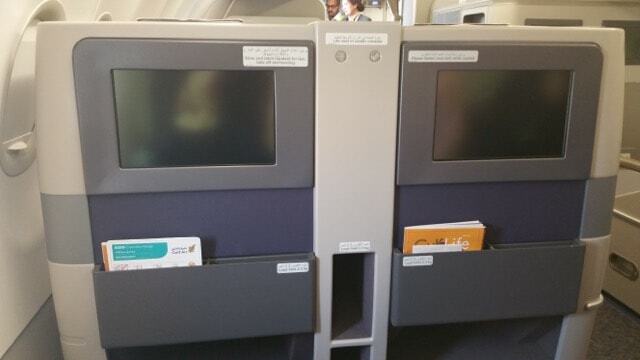 Even the business class seats were recliner and with less space too. Not sure why but I would have assumed you want a bigger plane for a busy route. Again the air hostesses were much nicer and polite than the ground staff. Which is a good sign in my opinion, hopefully you will only have to deal with them on a trip. Overall if I didn’t have a problem with treatment and almost denied boarding I would have enjoyed both legs of my trip. The planes are not the newest or shiniest but for the length of the trip they work fine. Not sure it they will be my first choice for a long haul flight however8 and I would certainly not want to deal with their customer service ever again. The price for the two return flights in business came to £1100 per person which is a lot if you are paying cash for a combined total of a 3 hour flight, we paid 24,000 miles per person and £79 in taxes for two.